Let’s celebrate diversity in Belfast together! 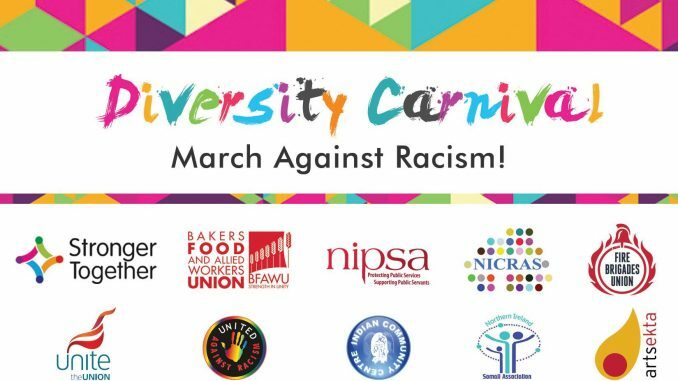 Join United Against Racism Belfast for Diversity Carnival, a positive march for pride, diversity and solidarity. We all need to stand united against racism and anti-migrant rhetoric. Migrants welcome, racists not! The carnival procession will leave from Writers Square in Belfast and march towards Belfast City Hall. Beforehand there is going to be an opportunity for the various community groups to get together and exchange solidarity and support. If your group would like to have a stall, please message the United Against Racism Belfast page. This event celebrating the vibrant and diverse migrant communities in Belfast is open to everyone. If your group wants to be part of the march, please message the organisers by leaving a message on the United Against Racism Belfast page.